An oasis of comfort and luxury - Hotel Classic Residency pampers you and makes you relax and unwind in their unspoiled luxury. The hotel has a majestic structure and stately interiors that lend an ambience of royalty and the personalized service, hospitality and comfort makes it a home away from home. ir conditioned and have private balconies and sit outs besides having facilities like running hot/cold water, cable color TV, direct dialing facility, laundry, doctor on call, daily newspaper and purified and filtered drinking water. You can savour the culinary delights at the air conditioned multi-cuisine vegetarian restaurant - Aagan. You can indulge your taste buds by choosing from the delectable vegetarian spread that includes everything from the delicious gujarati thali to baked vegetables in white sauce. There is a fully equipped business center for the corporate travelers. There are two halls which are just perfect for business meetings or for parties and family get togethers. 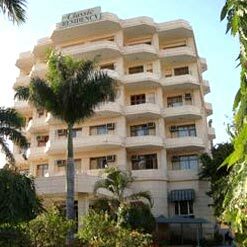 Utsav I can accommodate 75 people theatre style and Utsav II can accommodate 60 people theatre style. To unwind and rejuvenate you, the hotel provides ample facilities like billiards, table tennis, and a host of other indoor games. Arrangements can be made for white water river rafting, jungle jeep safari and river side camping. For the fitness freaks, the hotel has a gymnasium within its premises equipped with the latest gadgets and equipments.